Rick Tocchet has been named an Assistant Coach with the Pittsburgh Penguins, it was announced today by Executive Vice President and General Manager Jim Rutherford and Head Coach Mike Johnston. Johnston will look to add one more assistant coach to his staff. Tony Granato and Todd Reirden will not return to the Penguins’ staff. Jacques Martin will remain with the club in a yet-to-be-determined capacity. Mike Bales (goaltending coach) and Andy Saucier (video coordinator) will both remain in their current roles. Tocchet, 50, played 18 seasons in the National Hockey League, including parts of three seasons with the Penguins from 1992-94. He spent four seasons as an assistant coach with the Colorado Avalanche, Phoenix Coyotes and Tampa Bay Lightning and was head coach of the Lightning from 2008-10. A rugged right winger from Scarborough, Ontario, Tocchet scored 440 goals and compiled 2,972 penalty minutes in 1,144 games with Philadelphia, Pittsburgh, Los Angeles, Boston, Washington and Phoenix. He won the Stanley Cup with the Penguins in 1992. Tocchet’s best NHL season came with the Penguins in 1992-93, when – playing alongside Mario Lemieux – he recorded 48 goals, 61 assists, 109 points and 252 penalty minutes. He retired as a player in 2002. 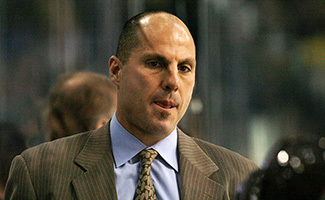 Tocchet began his NHL coaching career as an assistant with Colorado in 2002-03. He was named interim head coach at Tampa Bay in November 2008, replacing Barry Melrose, and had the interim tag removed in May 2009. Rick has a son, Trevor. Both reside in Pittsburgh.